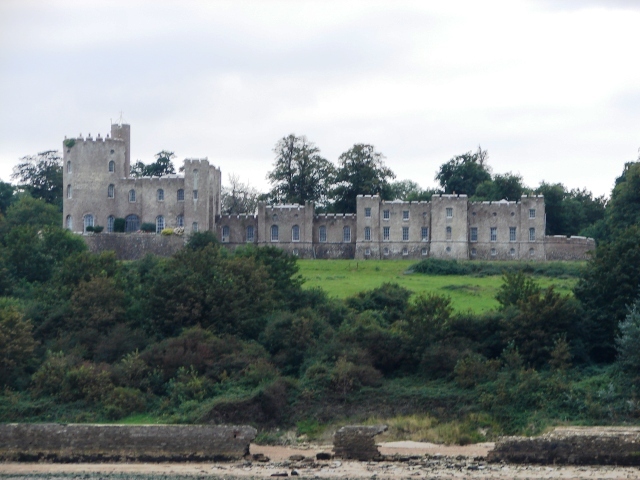 Notes: Norris Castle is located on the Isle of Wight and can be seen from the Solent standing on the northeast point of East Cowes. The castle was designed by James Wyatt for Lord Henry Seymour. It has a galleted facade with crenellations, but all of this is for show as the castle has no defensive fortifications. The building's original function was entertaining. Despite its size, it has only four bedrooms. The illusion of size is created by the fact that most of the building is occupied by only one room, and a passageway thick. Wyatt also designed the farmyard buildings that are further inland. They have the same design. King George IV visited the castle in 1819, and the future Queen Victoria with her mother the Duchess of Kent in 1831. Queen Victoria later purchased Osborne House, which is the next estate to the east. In the second half of the twentieth century the castle was opened to the public; it is now closed.